Fill your home with the aroma of fall as this classic, double-crusted, cinnamon-spiced apple pie bakes! To Make Pastry For Double Crust Pie: In medium bowl, sift together flour and salt. Add shortening; cut in with pastry blender or fork until the pieces are the size of small peas. Add cold water by teaspoonfuls, toss with a fork until all the flour is barely dampened. Turn mixture into a square piece of waxed paper or pastry cloth. Press the mixture until a complete ball is formed. Divide in half for bottom and top crusts. Wrap crust in waxed paper and chill 1/2 hour for easier handling. 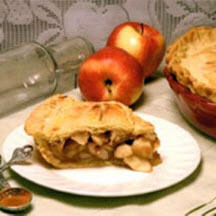 To Make Apple Pie: Wash apples; core and peel apples and slice thin. In small bowl, combine sugar, flour, salt and cinnamon. Combine sugar mixture and apple slices, tossing lightly to combine. Place on the top crust making several cuts or a design in center, for steam vents; adjust over filling and trim. Fold edge of top crust under bottom crust; press together with fingertips. Crimp edge decoratively. Lightly brush top crust with milk and sprinkle lightly with sugar. Bake in a preheated 450°F (230°C) oven for 10 minutes, then reduce heat to 350°F (175°C) and bake for about 40 to 45 minutes or until apples are tender and crust is golden-brown. Nutritional Information Per Serving (1/8 of recipe): 427 calories, 3 g protein, 66 g carbohydrates, 8 g fiber, 18 g fat (8 g saturated), 12 mg cholesterol, 3 mcg folate, 2 mg iron and 339 mg sodium. Recipe and photograph courtesy of the Wheat Foods Council.